The prickly Morgan Lee Faye has a penchant for family TV shows and a dislike for the people around her, but she’s the best travel agent in Tennessee. So good that she catches the eye of the mysterious proprietor of Avalon Travel, Mr. Kane. If Morgan accepts the job, she’s promised adventure around the globe and gold for her pocket, but she worries the offer is too good to be true. It is. And Kane isn’t the only one with a creepy agenda. Her co-workers all seem to want a piece of Morgan’s secret—even the two office hotties. Honestly, she just wishes they’d all go away so she can watch Little House On The Prairie. But that’s not going to happen because from Nashville to Avalon, faerie mischief is back! 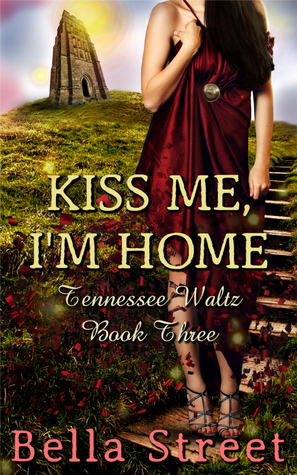 Bella Street gives her readers another incredibly imaginative story with this third installment in her Tennessee Waltz series. Before I go further, I have to say KISS ME, I’M HOME is a clever and absolutely perfect title for this book. Love it! This a story about the lovely, Morgan Lee Faye. She is an overachiever who is very successful in her work at a travel agency, but has very few social skills and no friends. The detachment she perfected growing up in foster care to hide her vulnerability (after being abandoned as an infant) has carried over into her life as an adult. Sadly, she has never had a sense of belonging or felt she’s had a real home. Her success at work leads to a transfer and promotion, where she finds things are not exactly as they seem. Despite her best efforts to keep everyone at a “professional” distance, Warren Foster, one of her new coworkers is patient and persistent, and manages to get close to her. He slowly gains her trust and eventually becomes a comfort to her. When they finally kiss it’s magical, addictive even, and takes Morgan away from whatever is troubling her. Kissing Warren lulls her into a near dreamlike state where there’s a familiar feeling of peace, tranquility, harmony and beauty like she’s never imagined. ~Complimentary copy provided in exchange for an honest review.